The title of this article is not hyperbole. Google is all powerful. They own the government, they own the Internet and they are even moving to control the Pentagon and the defense industry. And now, they own you! They are using their algorithms and artificial intelligence to dumb you down as this behemoth marches humanity towards its final date with destiny! Congress is not in charge. Trump is not in charge. And you certainly are not in charge. You now live in the world according to Google. The Google mandates are your new reality. The Constitution I am referring to is the Constitution according to Google. Your Constitution is dead! Welcome to the United States of Google where Jesus is considered to be an illegal immigrant. If you think that the social media giants are going to be corrected and controlled by Congress, think again. After reconsidering your position, I repeat: Do you think that Social Media is going to be corrected and controlled by Congress? If you do, I have some swamp land in Florida that I would like to sell you. Congress is made up of politicians and American politicians, due to the federal campaign finance laws, are mostly a bunch of prostitutes hanging out on a street corner waiting for the right “John” who has the most cash. There are a few exceptions to this rule (eg Paul Gosar and Rand Paul), but they are the rare exception. Make no mistake about it, social media moguls have the most cash and they have turned your representative into a social media whore . If there was any doubt as to the veracity of my words, let’s consider some facts and events which surround the social media censorship of conservatives, particularly Christian conservatives. After confronting several politicians about the illegal deplatforming of Infowars, Alex Jones held an impromptu press conference in an area where such impromptu conferences are held. In DC, the typical area, for these conferences is located outside the hearing room. These conferences happen nearly every day, but when Alex Jones attempted to do what everyone else does, he was approached by a policeman who told Jones that the conference was over and that he had to exit the building. People familiar with the practice of holding such press conferences have stated that they have never heard of this happening before. When Congress allows, or encourages its policemen to end such a press conference, they are clearly signaling a predetermined outcome. Google waves the cash, and the Congress drops to its knees. The game is rigged and the outcome is predetermined. Congress pretends to hold hearings, but in the case of Facebook, when Zuckerberg testified, he was not even sworn in. Google did not even show up to the hearings as they gave the big middle finger to both Congress and the American people. And if Congress was sincere about stopping the abuse of the Sherman Anti-Trust Act, Open Forum laws and restraint of business, Congress would be deposing the victims of social media abuse, not just the perpetrators of the abuse. Alex Jones should be a witness in an Congressional hearings as should Steve Quayle, Doug Hagmann, Ted Broer, Paul Preston and myself, et al. In reality, the only groups being allowed to testify before Congress are the social media minions where the Congressional inquisitors keep lobbing softballs for them to answer in front of the country. The Independent Media is the victim of their own success. CNN’s ratings are so low, that the channel is only used as a night light for incontinent Americans. The so-called readers of the Washington Post and the New York Times have discovered that the only thing that their newspapers are good for is to use the newspaper to house break puppies all across America. We no longer have real journalism in America, we have tabloid journalism, I am waiting for the NYT and WAPO to migrate to the checkout stand at your local grocery store as they take their place next to the National Enquirer. Over 80% of Americans under the age of 5o get their news from digital sources. Therefore, given the social media’s behavior, the First Amendment is on total life support. And the ironic thing is that America does not even realize that Google, Facebook and Twitter have “devoiced” the entire country. As I have said before, this is book burning. And we all know that where they burn books, they will soon burn people. The First Amendment is gone, soon it will be the Second Amendment. Would you care to guess what history says will happen next? If America cared about its Constitution and in particular, the First Amendment, tens of millions would be in the street. There would be nowhere that prostitutes like Marco Rubio could hide. Instead, all we hear is look how crazy conspiracy theorist Alex Jones is. The poor little nut case has finally been dealt with. These events in Washington represent the death of the Independent Media. Oh, a few us, like the defenders at the Alamo will indeed fight to the last bullet. However, the battle is lost, the strategic positions have been overrun and the hearts and the minds of the people have been captured by Google. IF you do not like my words, then I would suggest that you get down on your news and pray, because only divine intervention which would serve to motivate America to get into the street will produce any results. You better gear up and get prepped. The red bastards are not at the gate, they are eating from your table. Meanwhile, as a defender of the soon to be extinct Independent Media, I am preparing for my last stand. Soon all America will be living in a world according to Google. And if you know what Steve Quayle’s guests were going to present in Branson next week, you would not sleep for a month. As I said, welcome to the world run by Google. 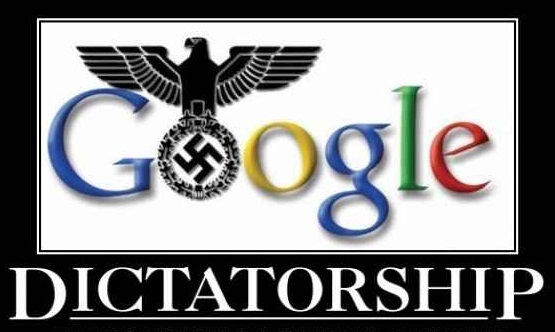 And when you consider Google’s ultimate goal, we are not talking about the end of free speech. We are talking about the end of humanity as we know it!